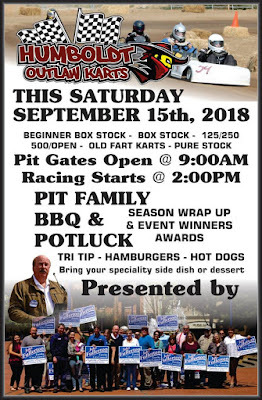 Eureka, CA (September 14, 2018) – With Fall on the horizon and Summer in its twilight, the Humboldt Outlaw Karts will celebrate with a special barbecue and potluck this Saturday at the Redwood Acres Fairground Bullring track. 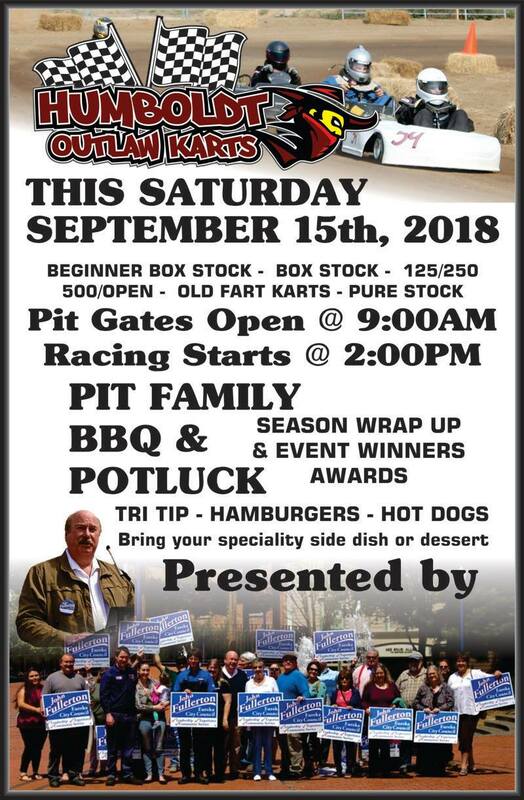 The event will be presented by John Fullerton for City Council and as always, the six local divisions will be in action on the still-new 1/8-mile dirt oval. Those planning on attending are encouraged to bring food to the event but are also encouraged to get in touch with HOK officials. Electric outlets will be available to anyone requiring power for necessary cookware. Pit gates will open at 9:00 AM with racing starting at 2:00 PM. The following is an editorial piece by site owner/administrator, Matthew Sullivan. The opinions expressed belong solely to the author and do not represent views of any other reporter, race track or sanctioning body. 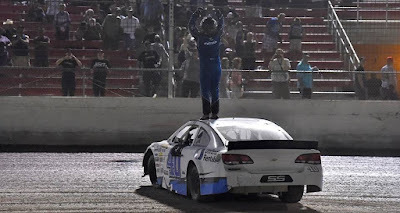 Last night's NASCAR K&N West Series Star Nursery 100 should have been a celebratory moment for many reasons. It was the first time since 1979 that the West Series raced on a non-paved surface and the first opportunity to see how current day NASCAR stock cars would fair on the dirt in a competitive environment. Instead of talking about the race, most will remember the race for the failure by those in charge of the speedway and NASCAR for failing to provide a track that could actually be raced on in a safe manner. The event was heavily advertised going into Thursday night as being the "first" ever dirt race for the NASCAR K&N West Series. As previously noted, the series did in fact race on dirt with the last race tacking place at at the famed yet long-gone Ascot Park half-mile in Gardena, California on September 8, 1979. Bill Schmitt won the 100-lap race over Jim Robinson and Jim Hopkinson. In fact, what was then known as the Winston West Series regularly raced on the dirt. The first year of Winston's sponsorship for the series in 1971 saw four dirt events on the schedule of the 26-race season. In 1972, the number of dirt events expanded to six races and got as high as seven in 1974 and 1975. When the West Series debuted in 1954 as the Pacific Coast Late Model Division, all nine races on the schedule were held at dirt tracks. Promoting the Thursday night race as being "the first" dirt race in the history of the K&N West Series seemed to be a major slap in the face to the drivers of yesteryear and to the fans who watched and supported those races. It may not be important in the grand-scheme of things but little circumstances like that have combined to be a big over-all reason why NASCAR's popularity has dwindled over the years. When NASCAR announced during the off-season that the K&N West Series would be racing on the dirt it immediately became a high-profile event. NASCAR fans have seen the Camping World Truck Series race at the Eldora Speedway half-mile and have been clamoring for another dirt event ever since the truck series debuted there in 2013. Many were eager to see the race and how the racing on the Vegas half-mile would compare to the action Eldora has seen. The problem was unless you were at the dirt track in Vegas, you couldn't watch the race. No the highly anticipated event was not broadcast live anywhere outside of Facebook and Twitter video feeds among friends. While the race will eventually be televised on NBCSN on Friday September 21, the excitement and anticipation to actually see the race will fade. Talk about a lost opportunity. Young up and coming female driver, Hailie Deegan made history by setting fast time for the Star Nursery 100. Besides being the first driver to set the bench mark for future K&N events at the Las Vegas Dirt Track, she became the first female in series history to earn pole position honors. It was a great and historic moment for many reasons. The heat races went off without major issues but then the 100-lap feature happened. Deegan led the field to the green flag but the race was immediately slowed when Todd Souza and Michael Kofoid spun in the first turn. The race resumed on lap six but it immediately became apparent that the track was not properly prepared for the race. Dust and dirt in the air are regular sites at any dirt race but the amount that was being sent up in the air was dangerous to the competitors. Three-cars wrecked on lap nine going into the first turn with several others getting damage because they couldn't see. In fact, drivers were driving through the infield believing they were on the racing surface when were not. After the incident, officials red-flagged the event and had the drivers pull off the surface so they could properly prep the track for the remainder of the race. Why wasn't the track prepped and ready before the action started? According to Matt Weaver of Autoweek Magazine, the surface is rarely watered because of high-water costs. So instead of having the track surface sufficiently prepared for the 100-lap race, drivers raced on a circuit that was completely unsafe for competition. After the track was properly set-up to race on, the rest of the race ran smooth. NASCAR Xfinity Series driver, Christopher Bell put on a show by driving through the field to the lead in a hood-less car only to be black flagged on a late restart violation. ARCA points leader, Sheldon Creed held off late race charges by Derek Thorn and Deegan to take his first West Series victory in his third career start. What should have been an historic event will be remembered for all the wrong reasons because of errors that required only basic sense. Las Vegas Speedway Dirt Track officials and NASCAR should be embarrassed and ashamed that they allowed the event to start on a surface that was dangerous and unsafe for the competitors and each share equally in receiving blame. Both the NASCAR West and East Series are struggling to draw cars every week. With only nine drivers attempting to race the full West schedule and the starting fields having 15 cars or less in stand-alone events, big mistakes like this only make things tougher for the series to succeed. As race fans, we can only hope that the mistakes made last night will serve as a lesson learned and next season's potential event on the Vegas dirt will be bigger and better. Failure to do so will only further injure a series that appears to be on wobbly legs. LAS VEGAS — It ain’t over until the checkered flag flies. Cole Rouse, Trevor Huddleston, Partridge, Matt Levin and Bell competed the top 10. Derek Kraus finished 17th after spinning twice due to flat tires and hitting the wall late. His second spin on Lap 94 set up the final restart. The NASCAR K&N Pro Series West will take a week off before visiting Meridian Speedway in Idaho for the NAPA Auto Parts Idaho 208 on Saturday September 29. The Star Nursery 100 is scheduled to air Friday September 21 at 2:30 p.m. ET on NBCSN. 1. (6) Sheldon Creed, El Cajon, Calif., Chevrolet, 102 laps, 40.746 mph. 2. (1) Hailie Deegan, Temecula, Calif., Toyota, 102. 3. (3) Derek Thorn, Lakeport, Calif., Ford, 102. 4. (12) Cole Keatts, Lewiston, Idaho, Ford, 102. 5. (11) Brendan Gaughan, Las Vegas, Nev, Toyota, 102. 6. (4) Cole Rouse, Fort Smith, Ark., Toyota, 102. 7. (10) Trevor Huddleston, Agoura Hills, Calif., Ford, 102. 8. (5) Ryan Partridge, Rancho Cucamonga, Calif., Ford, 102. 9. (18) Matt Levin, Tucson, Ariz., Chevrolet, 102. 10. (7) Christopher Bell, Norman, Okla., Toyota, 102. 11. (17) Austin Reed, Mooresville, N.C., Toyota, 102. 12. (21) Vanessa Robinson, Las Cruces, N.M., Ford, 102. 13. (20) Bill Kann, Scottsdale, Ariz., Chevrolet, 102. 14. (16) Tim Ward, Harcourt, Iowa, Ford, 102. 15. (24) David Hibbard, Chevrolet, 99. 16. (14) Takuma Koga, Nagoya, Japan, Chevrolet, 97. 17. (2) Derek Kraus, Stratford, Wis., Toyota, 93, accident. 18. (19) Todd Souza, Aromas, Calif., Toyota, 82. 19. (22) Tim Spurgeon, Danville, Calif., Chevrolet, 68, electrical. 20. (9) Kody Vanderwal, LaSalle, Colo, Ford, 59. 21. (15) Michael Kofoid, Chevrolet, 51, mechanical. 22. (23) Rich DeLong III, Santa Clarita, Calif., Chevrolet, 17, accident. 23. (8) Buddy Shepherd, Bakersfield, Calif., Ford, 8, accident. 24. (13) Hollis Thackeray, Gridley, Calif., Toyota, 8, accident. Lap Leaders: D. Kraus 1-5; H. Deegan 6; D. Kraus 7; H. Deegan 8-19; D. Kraus 20-44; C. Rouse 45-59; D. Thorn 60; C. Rouse 61; S. Creed 62-68; C. Bell 69-95; S. Creed 96-102. Standings: 1. D. Thorn, 465; 2. R. Partridge, 434; 3. C. Rouse, 430; 4. D. Kraus, 423; 5. T. Huddleston, 392; 6. H. Deegan, 391; 7. K. Vanderwal, 377; 8. M. Levin, 317; 9. T. Koga, 303; 10. T. Souza, 237. This Saturday it all comes down to one final night and one final race to crown the champions at Kern County Raceway. The “Coors Light Championship Season Finale” is the final event for the NASCAR Late Models, NASCAR Super Stocks, NASCAR Spec Mods, and INEX Legends. There are nine drivers across four divisions still alive to earn the ultimate prize, the 2018 Championship. In each of those four divisions, the title will be decided in the final laps of their respective main events. In the NASCAR Late Models, point’s leader Jagger Jones (Grandson of Parnelli Jones) holds a 60 point advantage over Zach St. Onge. That may seem like a large deficit to overcome, however the Late Models run twin main events this weekend, and St. Onge still has a mathematical shot at the title. In the other two NASCAR Divisions and the INEX Legends, the chase for the championship is much tighter. The NASCAR Super Stocks have the closest race for the title, as point’s leader Paul Ebersbacher holds a slim two-point advantage over defending champion Roger Holder. Ebersbacher, driver of the #02 and Holder, the pilot of the #24 have had a spirited battle all season long. The INEX Legends will have a National Qualifier in addition to their champion’s race. Colton Page, has closed the gap on point’s leader Josh Ayers over the last two races, as Page has won two in a row leading into the points finale. Ayers has a four point lead going into Saturday Night. The Coffey Brothers, Ed and Jim and early season favorite Jason Galvin will race for the NASCAR Spec Mod title this Saturday night. Ed Coffey sits third in points, 37 markers behind his brother Jim, the point’s leader. Jason Galvin, has tight hold on second, just seven points out of the championship points lead. The trio will battle it out to claim the title! Championship points are awarded as follows; drivers earn 3 bonus points for being quick qualifier, 2 bonus points for second quick, all other drivers earn 1 bonus point for qualifying. Main event winners earn 50 points; with each place behind the winner awarded 2 point less, per position. The “Coors Light Championship Finale,” this Saturday at Kern Count Raceway! Four champions will be crowned, and it all comes down to the final points races! Spectator gates for the Coors Light Championship Finale will open at 5:30 pm, with opening ceremonies at 7:00 pm. Monroe, WA (September 11, 2018) It’s been nearly two years since Doni Wanat visited Victory Lane in the Northwest Super Late Model Series (NWSLMS). 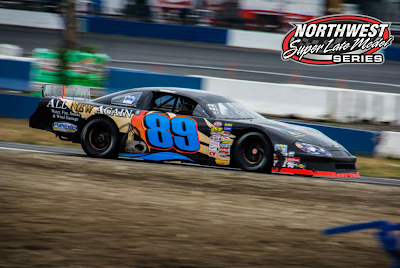 Not only did Wanat capture the checkered flag at the Les Schwab 100 at Evergreen Speedway, but also picked up Evergreen Speedway’s Washington State Super Late Model Championship and the Bud Crown Series Championship. All in all, a great day for the Woodinville, Washington driver. A late race pass to take the lead from Trenton Moriarity (Monroe, WA), who led from the green flag, set up a battle between the two that would take them right to the checkered flag. Starting in the 4th position, Wanat first had to catch Moriarity, who started on the pole after the 3-car invert and was untouchable most of the race. By lap 85, Wanat not only caught him, but had muscled his way to the inside of Moriarity to take the lead. Moriarity didn’t give up though, staying right on his bumper to the end. Coming for the checkered flag, the two came up to lap Andy Sole (San Tan, AZ) in turn 4. Wanat went high, Moriarity low into the dirt, trying to get back to the lead. Chaos ensued as Sole got spun and caught third place Jeff Knight (Monroe, WA). It was Wanat who crossed the stripe first to capture his first win since Wenatchee Valley Super Oval in September 2016. Knight survived a multicar incident at lap 29, when he and NWSLMS Championship Point’s leader, Brittney Zamora made contact and spun in turn 1 blocking the track and collecting nearly half the field. While Zamora’s car had extensive damage, she was able to hang on for a 14th place finish. Knight’s car had minimal damage and was able to get back to racing. He caught the leaders to challenge at the end, only to be caught up in the melee with Sole, ultimately finishing in the 7th position. Rookie Tanner Holm (Monroe, WA) captured his first ever podium finish in third, followed by Mitch Kleyn (Quincy, WA) and Gary Lewis (Snohomish, WA) to round out the top 5. The point’s battle has heated up going into the final event of 2018 at Wenatchee Valley Super Oval. While Zamora’s point lead is comfortable and a green flag in the feature event will secure her second championship, the biggest battle is for second position. Sole, Kleyn and Moriarity have only two points separating the three. The tight points battle should provide added excitement for the championship race. The NWSLMS Tour returns to action September 22-23rd at the Fall Shindig at Wenatchee Valley Super Oval for the Neal Newberry 125. This will be the series season championship event. For more information log onto the series Facebook page, website www.nwsuperlatemodels.com or Wenatchee Valley Super Oval www.wvso.com.